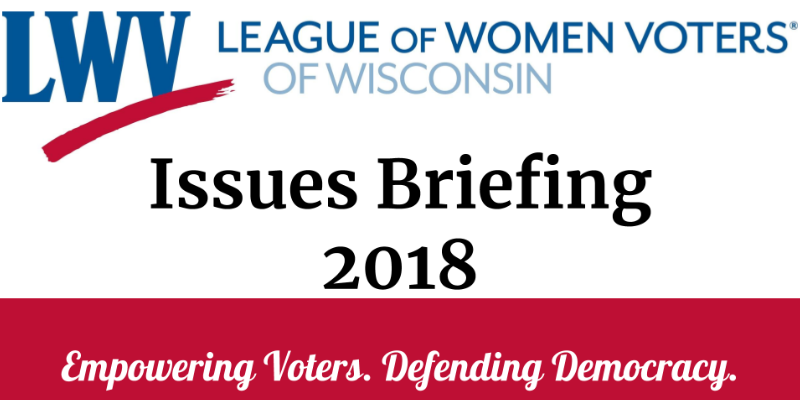 After a busy election season, nearly 150 League members and friends gathered at LWVWI’s annual Issues Briefing on November 10 at Holy Wisdom Monastery in Middleton. Between informative presentations and panels, guests had the opportunity to network with each other and the State League board and staff. They also took in the wonderful and thought provoking art exhibit, Women Against Hate, United by Love, by artist Kelly Parks Snider. Meagan Wolfe, interim administrator for the Wisconsin Elections Commission, kicked off the day with her presentation about thedifferent ways her agency has increased cybersecurity measures in Wisconsin elections. Wolfe described the pros and cons of Wisconsin’s decentralized election system as being tough for bad actors to disrupt, but also challenging to find dynamic approaches for election security training for clerks and poll workers. Attorney Jodi Habush Sinykin is a Midwest environmental advocate who is working to defend the Great Lakes Compact. She delivered a lecture about the importance of the compact and how FoxConn endangers the compact when it seeks to divert water to out-of-basin Racine for private manufacturing purposes. LWVWI originally joined with the Midwest Environmental Advocates (MEA) in objection to the City of Racine’s request to divert Lake Michigan waters. Sinykin shared how the League, with LWVWI VP Louise Petering coordinating efforts, has been influential in spreading awareness of how the permit sets a precedent for future water withdrawals that threaten sustainability throughout the area. LWVWI is co-sponsoring an exciting civic education project being launched by the Wisconsin Newspaper Association (WNA) Foundation called The Civic Games. The games will follow a “quiz bowl” style format in several regions across the state and cumulate in a state final in Madison in February 2019. The hope is to continue the competition annually to increase civic education and knowledge throughout Wisconsin. If you're interested in this project, you can learn more and also encourage your local high schools and teachers to participate in the games by sharing information about the Civics Games from their website. Panel: United by Love - United Against Hate: Building an Inclusive Community moderated by Artists and Activists Kelly Parks Snider and Rachael Griffin. Moderated by artist and activist Kelly Parks Snider, a panel of local activists that included Rachael Griffin, Masood Akhtar, United Against Hate, and Tracy Williams-Maclin, UW External Relations, Partnerships, and Development, discussed the importance of building an inclusive community through being aware of realities outside of and beyond ourselves. They reminded audience members that reaching out to create space for those different from us is important in order to build bridges between different communities, regardless of identity. Their combined messages are to work together, love, forgive, be a witness, lift up those who have this message, and speak up. Panel: The Role of Media in Our Democracy moderated by Joy Cardin, Former Host, Wisconsin Public Radio. WISC News 3 TV. While attendees brainstormed questions, panelists addressed the roles that they believe the media has played in politics, and highlighted their interpretations of what role they believe they should play. While emphasizing independence and being factual, the panelists promoted vigorous discussion as they considered the important role of journalists in protecting democracy and cited the challenges of getting access to elected officials of both parties. The League of Women Voters of Wisconsin talked with real Wisconsin voters - in their own spaces - and asked them to tell their stories of why they're a Wisconsin voter. The Be A Wisconsin Voter video series showcases their unique stories about why they vote and why the right to vote is important.